Which is the one advise that you get showered with most after being diagnosed with any kind of heart disease? 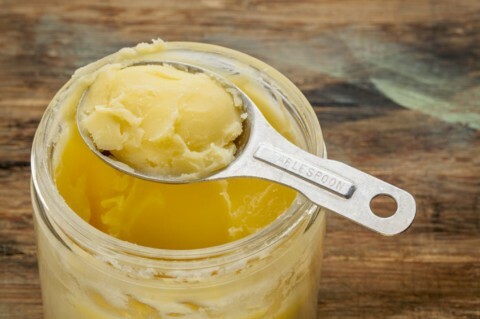 Ghee, a close relative of the Clarified Butter, is a fat derived from simmering the cultured butter. In the Indian subcontinent, people have been using it for food preparation, as a medicine, and in religious rituals for thousands of years now! Need a 101 on how to prepare Ghee at home? Is that a BAD thing though? Depends on how much Ghee you are consuming. Both Indian and American Dietary Guidelines recommended that Saturated Fatty Acid intake should be kept under 10% of total energy intake for a healthy heart. Now, what does that even mean? Here let me explain; if you are 5 feet something, 50kg something, 25–35 something female of India origin who does mild-moderate exercise, your Basal/Resting Metabolic Rate will be somewhere around 1300 Kcals. If adjusted for physical activity, your Daily energy needs will be somewhere around 1600 Kcals. Energy Calculator Here. So 10% of 1600 will be 160 Kcals. Now 1 g of Fat provides 9 Kcals. So how many grams of Saturated Fats will provide you with ~160 Kcals? 17.8 g of fat! Now, what does that look like? 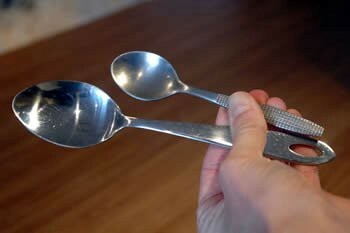 👈Difference Between a normal kitchen Tablespoon and a teaspoon! And don’t forget that all these measurements are correct only if you are taking a flat/leveled amount of ingredient, and not a heapful! *** We do get some SFAs from milk and milk products, cooking oils and packaged foods, hence always keep your threshold below the allowed amount of 15–17gm, that way there is no way you will go above! The Myths or are they really the myths? You must have heard it from several diet gurus and your friends that follow them oh so avidly! What lubricates our joints is Synovial Fluid. And what constitutes synovial fluid is mostly suspended connective tissues and hyaluronic acid. Ghee or as a matter of fact any other fat has got nothing to do with your joints and their lubrication directly or indirectly! So, Ghee lubricates Joints, is a MYTH! 2. Ghee is good for skin! To an extent yes. Our skin, the largest organ in our body, is made up of skin cells, which are protected by cell membranes, and cell membranes are made of a lipid bilayer (a double layer of phospholipids!) So you can imagine how important fats/lipids are to the integrity of every single cell! So yes Ghee is good for skin integrity, BUT so are any other and many other better and healthier fats! Thus, saying that Ghee is good for skin is A HALF-TRUTH! Similarly, assimilation of Vitamin D, absorption of Fat Soluble A, D, E, K vitamins is an attribute of all fats and oils and not just Ghee! Ghee does contain Butyric Acid, a short chain saturated fatty acid. Butyric Acid has shown to have a positive role in maintaining gut health, and also reducing cellular inflammation. Not just that it has some immuno-modular effect as well. However, our body is capable of making its own butyric acid provided that we follow a diet rich in dietary fiber (fruits, whole grains!). And not all sources of ghee provide a significant amount of Butyric Acid, there are major differences in butyric acid concentration of store bought (different brands) and home made Ghee. Check out this comparative study. 4. Ghee is full of antioxidants! Friends, Ghee is just Ghee…just the whiff of it reminds me of my childhood, it reminds me of Diwali, and brings forth memories of my room-mates who loved ghee and with whom I used to eat in the same a plate (we were just too lazy, so instead of washing 3 different dishes, thought why not eat together!) Anyways, point is, instead of glorifying a butter fat, and just because it is good in these two things assuming that it must be really good in 10 more things is absurd! Its like assuming because Sachin is a great batsman he must also be really good at doing Bharatnatyam and also must be an extremely fluent Russian speaker (now we do not have any proof that he isn’t but we also don’t know for sure that he is)! So, stop glorifying GHEE and just eat it for the love of the food! What is the shelf life of ghee? For how long should we use the home made ghee?